Many amateurs prefer to use equipment they see being used on Tour, whereas Tour players prefer to use equipment that will perform and fit their eye. The new 2014 TaylorMade Tour Preferred irons are geared towards both sets of players. 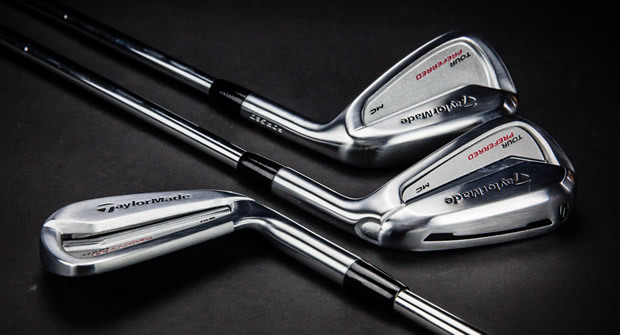 Similar to the launch of their TP CB, MC and CB irons back in 2011, TaylorMade have released three new Tour Preferred heads for the 2014 season. Each offers slightly different levels of forgiveness, feel and distance, all in a Tour Preferred look. “We don’t believe you can call yourself a great iron company unless you create irons that great players want to play. Irons that meet a Tour pro’s requirements for look, feel, sound and workability,” said Sean Toulon, Executive Vice President. The TaylorMade Tour Preferred CB or Cavity-Back irons are the largest, most forgiving iron in the set. They look very like the recent SpeedBlade iron, but are slightly more compact, meaning they will suit a slightly lower handicap range. The key to the forgiveness is the Speed Pocket in the sole. Featured in the 3 to 7 iron, the slot in the sole extends 10mm into the sole and is filled with a polymer material designed to keep out debris. The slot helps the face to flex at impact, promoting faster ball speeds, especially on shots hit low on the face. Each iron is made from a cast and the set features a subtle but progressive head design throughout the set. The short irons are compact with very little offset, but the longer the club in the set, the larger the head size and offset becomes. The TaylorMade Tour Preferred CB irons are available now in an eight piece set from 3 to PW for £749. The MC or Muscle-Cavity irons combine the shape and look of a better player's iron with a shallow "muscle cavity" that increases the forgiveness and launch. 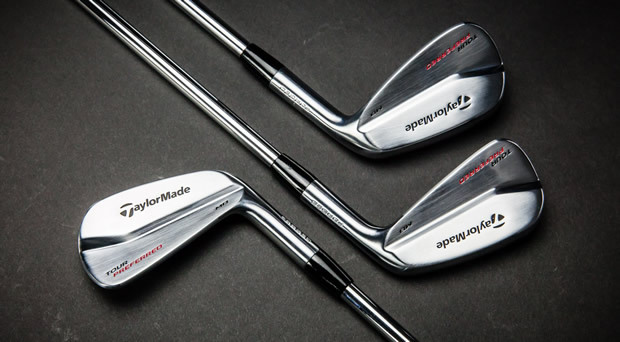 As with the CB irons, the MC's 3, 4, 5, 6 and 7 irons feature TaylorMade's Speed Pocket. So whilst the look and satin-chrome finish give the appeal of a better players iron, the Speed Pocket provides the additional ball speed and forgiveness many players want. The length of the clubheads along with the width of the topline and sole are slightly larger than the Tour Preferred MB set. Whilst the long irons are cast, the 8 iron through PW in the MC set are forged, which again adds to the feel that the game's better players desire. The TaylorMade Tour Preferred MB irons are available in an eight piece set from 3 to PW for £849. The TaylorMade Tour Preferred MB or Muscleback irons are TaylorMade's classic blade style iron. Forged from a soft, carbon steel, they offer the workability and feel that Tour players prefer. TaylorMade consulted several members of their Tour staff to design the MB irons and thus the shape is compact and traditional with a thin top-line and very little offset. Players also asked TaylorMade's R&D team to produce a sole design that has less camber. The TaylorMade Tour Preferred MB irons are available from January 20th in an eight piece set from 3 to PW for £899. All three of the Tour Preferred models come fitted with the latest KBS Tour shaft in either X-Stiff, Stiff or Regular, along with TaylorMade Tour Velvet grips. As is the case with all of TaylorMade's new equipment, custom shafts and grips are available also.